Taking a load off ... 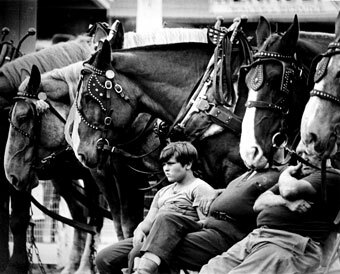 This husky teen waits with his uncles for their turn to lead their animals into the ring for the horse-pulling contest at the Lancaster, New Hampshire country fair. By all appearances, the boy is well on his way to becoming his uncles, sitting nonchalantly among the dangerously strong horses. A single mis-step by one of the horses could easily break the boy’s foot or knock him on his ear. In a few minutes we’ll see the horses work in teams to pull a sled containing thousands of pounds of granite block. Then trot back here to blow off steam, calm down, and wait their next turn. The men spend the late summer months trailering their animals from fairground to fairground, trying to prove their beasts the best. During winter the men work the horses in the woods, hauling out cords of just-cut wood. Whether the horse pull keeps the animals in shape for winter work, or the winter work trains them for the horse-pull circuit is hard to guess. By the way they prance about and step lightly, there’s no doubt these horses love to pull a heavy load.